Mike Rothenberg, the Silicon Valley venture capitalist who took a reputational nose dive last year after several allegations came out against the way he was running his firm, is feeling bolder lately. One big clue, among others: After renaming his firm Frontier Tech Ventures last year, he plans to revert to the eponymous brand he originally used, Rothenberg Ventures. Rothenberg assigned the firm the name Frontier Tech Ventures in September 2016 after a series of events tarnished the brand, starting with an SEC investigation, which opened in July of 2016. What drew the agency’s attention: Rothenberg himself, whose lavish spending to market his fund began to concern employees, as well as his 176 investors — almost all of them wealthy individuals who weren’t given visibility into the firm’s spending, and who didn’t ask for it, until people began abruptly leaving the firm. Several key executives headed out the door in mid-August, followed by a larger exodus — then came some lawsuits. One of those suits alleged that up to 50 employees failed to receive payment due them from the firm. Another, filed by a separate former employee, claims this person was asked to run up more than $100,000 in business expenses on an American Express account at the direction of Rothenberg — and was never repaid. Throughout, the SEC was looking into allegations of wire fraud, bank fraud, whistleblower retaliation and breach of fiduciary duty — and Rothenberg wasn’t taking reporters’ calls. That’s changing. In an interview earlier this week, Rothenberg confirmed for the first time that he was the subject of questions by the SEC, saying he has done everything to comply with those questions. He further says he isn’t aware if the agency is still looking into his affairs. The SEC declined to comment for this story, but one whistleblower tells us he was last in touch with the SEC in October. The former chief of the SEC whistleblower’s office, Sean McKessy, says that doesn’t reveal much, however. “Seven months may seem like a long time and it’s easy to say, ‘Oh they may no longer be looking into it.’ But generally speaking, investigations can take anywhere from two to five years,” McKessy says. He adds that targets of SEC investigations are usually told by the SEC if the case against them has been closed. Either way, investors might be reluctant to invest again with Rothenberg, given what his own investors characterize as highly unorthodox practices. While Rothenberg’s spending became renowned to those in his circle — think executive assistants, a private driver, a race car sponsorship, Hollywood parties — his money management also raised flags over time. For example, TechCrunch reviewed documents that show Rothenberg had wired himself a salary of $1.2 million from Silicon Valley Bank in small increments throughout January 2016, and that he had the firm take out a $5.2 million loan from the bank that was initiated on December 24th of 2015. Multiple sources tell us these actions were taken without investors’ knowledge. Separate documents sent to TechCrunch show that Rothenberg wired $1.7 million directly to his personal bank account on February 25, 2016 — the same day an outside investor, Transcend VR, a subsidiary of Pilot Grove Management, wired $2 million to be used for Rothenberg’s own virtual reality startup, River Studios (also known as Bend Reality LLC). The SEC has the power and authority in some circumstances to go after venture capitalists for using investor funds for personal purposes. Whether Rothenberg’s activities rise to the level of violating any laws or regulation is still at question. Indeed, Rothenberg doesn’t hesitate in telling TechCrunch he invested money from Rothenberg Ventures in River Studios. “The investment firm made an investment in River Studios that was explicitly allowed for and something we have disclosed to our investors,” he says. But River Studios has been particularly troubling to investors. “Mike 100 percent did not ever disclose the investment in River,” says one limited partner. In fact, this same source tells TechCrunch investors were led to believe that Rothenberg had secured outside investment funds for River Studios, not the firm’s own funds. It’s still unclear to investors if any of these transactions were illegal, but many close to Rothenberg have deemed the transactions unethical, and several investors have told TechCrunch they are not planning to invest in the fund again. In the meantime, Rothenberg now runs a much leaner team, down from 50 to 60 people at its peak some time last year, a figure that includes contractors. Former partners Tommy Leep, Brandon Farwell and Fran Hauser are also no longer on speaking terms with him, according to sources. And whether or not he’s still under SEC investigation, he still has two legal battles coming up, including one with the former employee who has accused Rothenberg of “wrongfully and capriciously” refusing to pay his Amex debt, which he says he ran up at Rothenberg’s direction, including to pay day-to-day expenses incurred by the firm. Rothenberg seems to think the chaos that encircled his firm last year owes to a series of misunderstandings. The question for anyone considering working with him in the future is whether he learned any lessons from what went wrong. “I think each year that I’ve done this has been a tremendous learning curve,” he tells us. A minute later, Rothenberg, who first ran into trouble owing to profligate spending, adds that he plans to host a Founder Field Day — a startup party likened to “a scene lifted from HBO’s Silicon Valley” — in the near future. He also still maintains a luxury suite at Oracle Arena where he takes clients and friends to see the Golden State Warriors play. 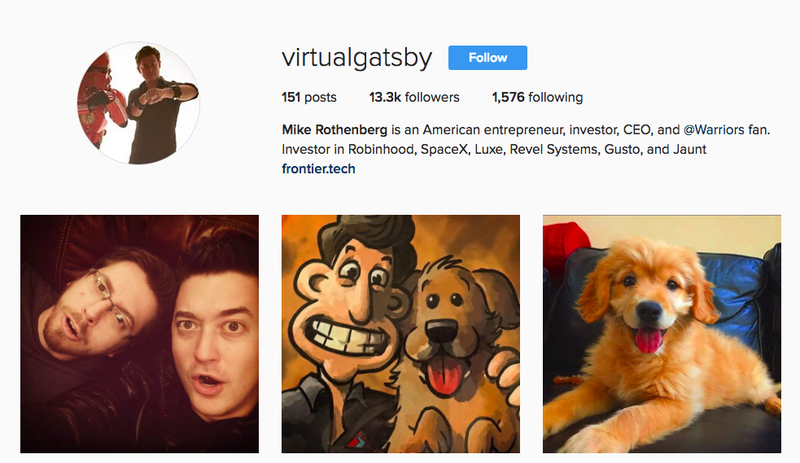 In a move that seemingly makes light of reporting about Rothenberg’s fumbles, he has even changed his Instagram name to “Virtual Gatsby,” a designation from the original TechCrunch piece we’d written on the firm’s rise and fall. No doubt, Rothenberg, who reportedly hasn’t made any investments since last August, according to a source, is emboldened by at least one recent win. According to this source, in December 2016, he informed investors he was selling Rothenberg Ventures’ stake in the online brokerage firm Robinhood for a 20x return on its initial $100,000. Update: According to a source close to the matter, there has been no such transaction with Robinhood, though it’s unclear if any transaction has been discussed. Even Rothenberg’s many frustrated individual investors acknowledge that the portfolio he assembled over the years holds potential winners, with bets that include the point-of-sale systems company Revel Systems, which just sold a majority stake in its business to a private equity firm. Many of these same investors seem hopeful that, at a minimum, they might someday make back what they invested in Rothenberg Ventures. It’s one reason they haven’t taken action against the founder, some say. What they are less eager to concede is that Rothenberg is the sole general partner, which may make it difficult to find a basis for taking legal action against him. While they may no longer trust Rothenberg, one LP readily concedes that they have only themselves to blame for supporting him in the first place. The lesson, suggests this person? To read the fine print the next time around.